Why is intellectual property important? When is a good time to start talking about intellectual property for your invention or discovery? What should I know about intellectual property? What does it protect? Mr. Arman Nadershahi is an expert in patents, trade secrets, FDA, product development, corporate law, operations, and mergers and acquisitions. In this seminar, he will talk about the importance of intellectual property through case study examples. 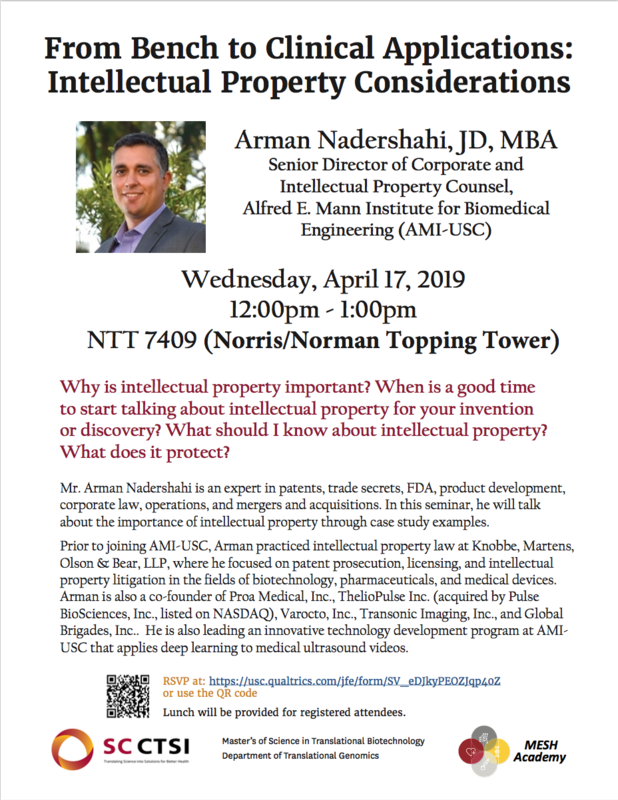 Prior to joining AMI-USC, Arman practiced intellectual property law at Knobbe, Martens, Olson & Bear, LLP, where he focused on patent prosecution, licensing, and intellectual property litigation in the fields of biotechnology, pharmaceuticals, and medical devices. Arman is also a co-founder of Proa Medical, Inc., ThelioPulse Inc. (acquired by Pulse BioSciences, Inc., listed on NASDAQ), Varocto, Inc., Transonic Imaging, Inc., and Global Brigades, Inc.. He is also leading an innovative technology development program at AMI-USC that applies deep learning to medical ultrasound videos. Lunch will be provided for registered attendees. Please register here. Please email Juli Wu for any questions.